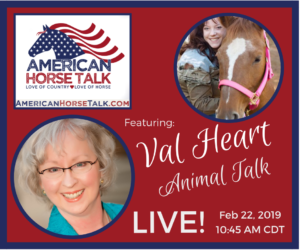 Watch as Val Heart of Animal Talk tells her horse story on American Horse Talk LIVE on Friday, February 22nd, at 10:45 AM CDT. To comment live, go to the American Horse Talk Facebook PAGE. To join the livestream, be sure to download the BeLive.tv app in advance and log in with your Facebook account, then shoot us a direct message that you’d like to join the show!